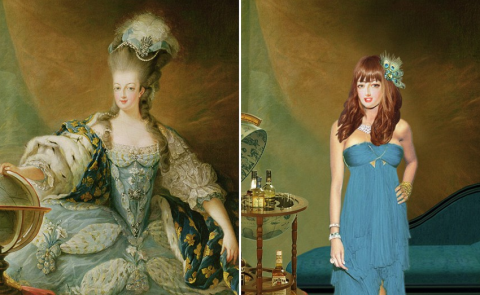 What would a modern Marie Antoinette look like? Her hair would hang down; her once crooked teeth would be straightened; she'd continue to wear designer clothes; and, yes, she'd sadly have some surgical enhancements too. A far cry from how the more stately Queen Elizabeth I might look today. These images come out of a Telegraph gallery that gives historical figures a modern makeover. Other figures re-imagined here include Shakespeare (who goes a little hipster doofus), Henry VIII, and Admiral Lord Nelson. Would the champagne coupe be a different size now?